Explore the role of temperature and salinity in changing the density of water samples. Observe and discuss the impact of density differences in the ocean. Ages 8 and up. This lesson can be scaled with ability level. Lesson support for elementary, middle, and high school students are included. Establish some properties that define an ocean habitat. Observe interactions different water masses have with each other based on density. The focus of this lesson will be the impacts of properties like temperature and salinity on seawater. The term water mass refers to a body of water that has consistent physical properties, such as salinity and temperature. There are multitudes of water masses in the ocean that are divided by density differences; they do not require a physical barrier to conserve their unique physical properties. The differences in density are one mechanism that drives vertical circulation of the ocean. The physical properties of the ocean are important to the biology as well. Many marine animals either remain within a water mass favorable to their needs or must adapt to changing water masses. •	Record starting conditions, hypothesis, observations, and explain results. •	Intended for students of grade 6 and up. •	Record starting conditions, including measurements of mass and volume, hypothesis, observations, calculations of density, and explain results. •	Intended for students of grade 9 and up. •	This worksheet includes more calculations, and asks for more detailed support of the explanation of results. Set out materials including student beakers and density tanks. Pre-measure salt into small Petri dishes or watch glasses. a. Vary the quantity of salt in the dishes from a little to a lot. b. The largest quantity of salt available to students should still dissolve easily into their water sample. a. Fill the 2L beaker with ice and top off with water. b. Fill hot pots with water, and turn on. Instructor will introduce the lesson, and explain that students will work in pairs for this experiment. Explain all the steps of this experiment to students in the order in which they need to be performed, and briefly explain how to use the density tank when they reach that step. a. Have students decide with their partner what kind of water sample they will make. Each student will make their own water sample, but they MUST vary at least one variable from their partner’s sample. They may choose hot or cold water, and fresh or salty water. They must also decide who will have red water, and who will have blue water (they must have two different colors between them). b. Have students record their water sample decision on their worksheet. c. Have students record their hypothesis on their worksheet. Students will prepare the water samples as planned. ii. For Cold Water Samples: Fill to the 200mL mark from the ice water. If ice water runs out, refill the 2L beaker with more water, the ice will chill it fast. d. Use stirring rod to ensure sample is well mixed and salt, if any, dissolves. Pass out density tanks to each pair of students; ensure the center barrier is in place. Perform density experiment. (Instructor may need to demonstrate how to use the density tank). a. 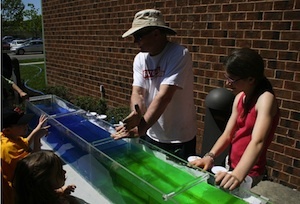 Students pour water samples into the tank simultaneously, one on each side of the divider. b. Once the water has stilled, pull out the divider in one smooth motion. Students will record their conclusions about the relationship of density to the observed behavior of the water samples in the density tanks. Have students record whether their hypothesis was correct. Why or why not? What affect does density have on the behavior of water in the density tanks? What can students think of that water density might impact in the ocean? Show visuals of real-time data of the New Jersey Coast displaying sea surface temperature and salinity. 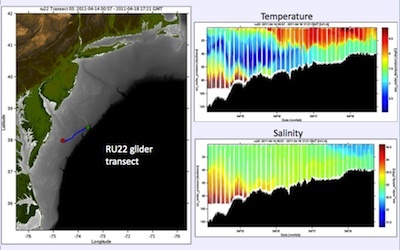 Display data collected by gliders of temperature and salinity at depth (along Rutgers University, Institute of Coastal Marine Studies IMCS endurance line*). See if students can explain any observed differences between the surface data and that collected from depth. 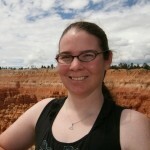 What impact do differences in water density have in the ocean? How would you relate the concepts of temperature, salinity, and density to ocean habitat? Hot water could cause burns; care should be exercised with this portion of the activity. If salt water gets in eyes, flush immediately with plenty of fresh water. The salt should not be harmful to vision, but can sting.